I’ve always wanted to try my hand at Twine. For those not familiar with it, Twine is open-source software designed for writing your own interactive story-based games. You can write individual pages in basic HTML markdown, illustrate them with images, then upload them online and let other people play them. Essentially, at its core it’s basic game creation software, as long as the game in question is a multiple-choice branching story. It’s something I’ve been meaning to try for a while now, but I’ve never had the right inspiration. Then I realised: why not make a Twine version of one of the greatest stories ever told in history? 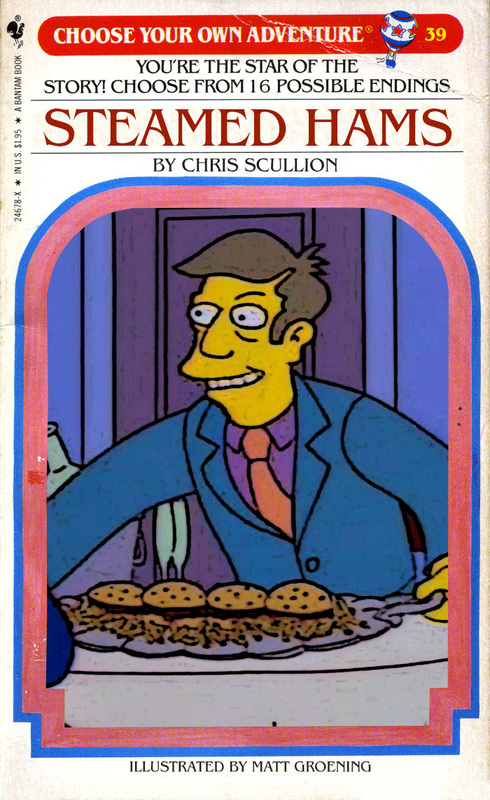 I am, of course, referring to Steamed Hams, an epic tale of one man, his boss, his lunch and his mother. My game/story is hosted on philome.la, a site that offers free hosting of Twine stories. Click this link to be taken to my story, where you can play it. Can you get Skinner through dinner and keep Superintendent Chalmers happy? Play and find out!